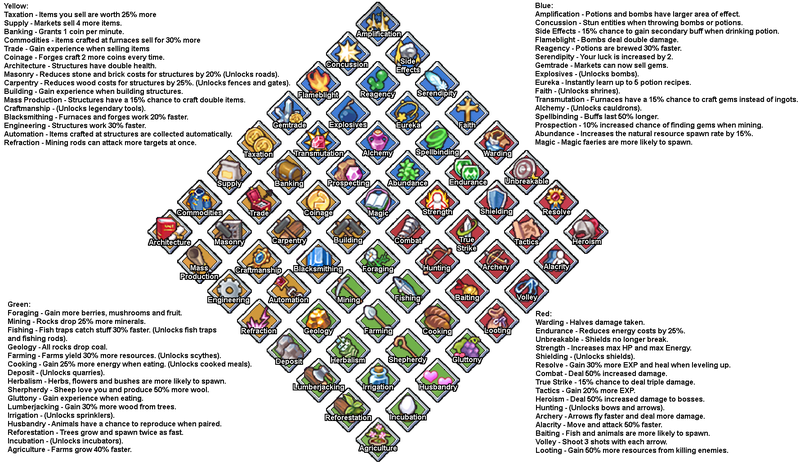 In case anyone wanted to plan out their levels. Someone please feel free to make a better version of the picture. This is for the demo only. Great work! I am gonna pin this. You should do the same for the final version, I changed a lot of things, moved some things around and also added more skills too. Maybe we can get a wiki going? can you tell me how to run the game cause I've tried but only worked once since then I don't know how to do it cause I didn't know how I did it so can you tell me how to run the game please? I have a problem when I start the game, it loads for a few seconds and then crashes. in the end, I can’t start it up, but I really want to play (about the new version). how to fix it? I am humbled that you think the picture good enough to pin. A wiki you say! Not much added to it yet. In fact it's missing some pretty basic stuff like building a shovel unlocks the mill, so feel free to add anything Julemanden. I'll add more to it when I get the final version or a test version. In fact the wiki should probably be split for the tutorial and final version. It wouldn't be the first time I've done wiki work. It would probably make more sense to just keep it about the demo for now, later on you could just bin that or add whatever is new. No telling when the full version or anyother version will be ready. The wiki is starting to look nice with the awesome pages added by Julemanden. I added a quick navbox to tie it all together and it's now a decent wiki. I added it to wiki. I hope it was okay to add the logo to the wiki. It might be prudent if the dev creates a FAQ page and a media page that has links to all the important web pages like the demo itch.io page, steam page, etc along with a statement saying something along the lines of, "It's okay to use the logo and game art for wiki documentation purposes." and a link to the game license. That looks amazing! Going to leave the art to you for now on lol. Only thing that would be better is an interactable one. If you could upload a picture of just the icons with no background I will look into making an interactable one down the road. 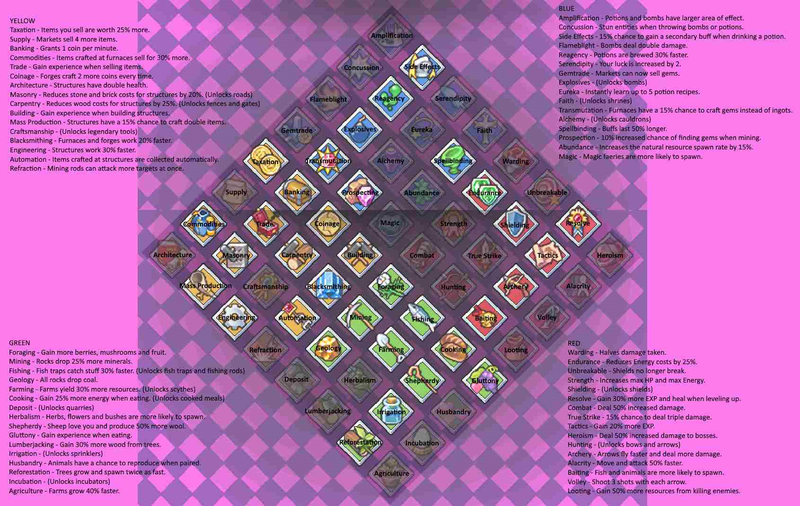 The only page missing now is how to unlock everything unlockable in the demo. I might also make a tips and tricks discussion page. The controls page also needs to be translated into english. Much cleaner and easier to read. Thanks for updating it. Did you unlock everything through normal leveling? I'm not sure how tactics works. Is that 20% more xp for doing any action that gives xp or is it only combat related? Also not clear how resolve actually works. Healing on level up makes sense but I didn't see any 30% bonus xp when leveling. Hard to measure anything since actual values of xp aren't shown. I got all the implemented ones legit (except the ones around tactics, as i didnt know they existed). But levelling beyond like 45 or something takes ages, so I used the exploit I wrote about in the bugs thread. Not not really sure about tactics, as we cant get exact exp values. But I feels like that with the other 30% makes it faster. But allas i cant be sure. I modified the navbox to help organize the rapidly expanding wiki. It's surprising to think just about a week ago it contained practically nothing, so great job wiki editors! When the time comes I can make subcategories in the navbox for the demo vs the full release. Trying to get in contact with the wiki founder to see if we can get the theme to match the game art style. does any one have the wiki page? Hey guys, wiki is looking great! You may have to remake it from scratch once the game comes out, because I changed a bunch of things around... Whoops, sorry! Is there anything I can do to make the wiki-creation process easier? You of course have permission to use any game asset (including the logo) in the wiki for non-commercial, information sharing purposes. Creative mode for testing to provide quick and accurate information. Sheets of game assets for easy inclusion in the wiki. A quick guide that lists features and content you'd like to be in the wiki (maybe not so obvious features) and inversely you'd like to be left out of the wiki (things you'd like players to discover on their own). Free game keys as a reward for the current top contributors when the game comes out which can be found here(preserved). All nine of them have donated their time without expecting a reward and the wiki wouldn't be what is currently is without each of their help. I think that's all that's needed to continue a healthy wiki. Don't worry about changes. The front page is left as a welcome on purpose and the navbox will be split into release and demo and all the current pages in the navbox will be prefixed with the word demo preventing overlap. That's the plan at least. For the demo version. I think it's pretty complete.